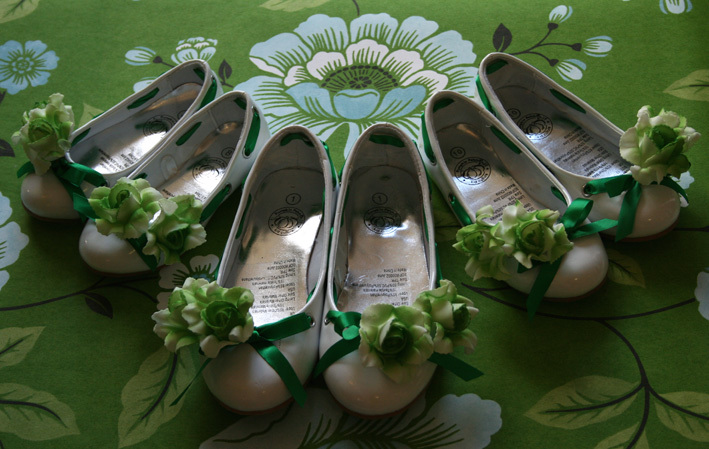 I’ve been channelling my inner Martha Stewart this afternoon, pimping out plain white shoes for the flowergirls (my wee nieces). The shoes cost $10 a pair on sale at Pumpkin Patch, the ribbon was $1.50 a metre from Spotlight and the greeny-white faux flowers cost the princely sum of $2 from the $2 shop. Aww, so cute – and so cheap! My sister just told me that the shoes weren’t the ones that were on special for $10. They were $24.99. I thought I was getting a bargain, but apparently not! Heh. They still look very pretty and I’m guessing they’re going to suit your theme perfectly. The countdown is on, you must be getting very excited now! Love these, and love the fabric that they are sitting on just as much. The fabric is actually a roll of wallpaper that I bought for my new kitchen, but then decided was a tad too bright. So I’m going to cut it into strips to use as a table runner at the wedding instead! Gosh, that is a great idea! I loved the print too, didn’t realise it was wallpaper! You have so many good ideas….I’m just not one of those people who can make pretty out of anything. I think my craft gene has been suppressed by my green fingers for too long! Thanks Debbie. The girls tried on their shoes and dresses today. Talk about grinning from ear to ear. Super cute. I enjoy your programme on prime and your weekly news letter.You bring a ray of sunshine into peoples lives each week as well as knowledge.. Thankyou for that. Thanks Jude. I don’t mind if it rains (I’m lying, obviously) but if it’s windy we’re in trouble as we’re right on top of a hill. I’m pretty sure that rain on your wedding day can be a good luck omen, but I’ve never heard of an airborne marquee being good luck! I have a little lawn that is a little sad at the front of my house! Next Saturday (Your wedding Day) I am going to sprinkle Cosmos all over it so that every time I look at the flowers I will think of you and how you manage to make me smile every time I hear you talk or read your weekly newsletters. The Hunk is very lucky, but I am sure you are too. When can we see him? Don’t sprinkle too much of the stuff! I’ve started hacking it back now. I’ll put up a pic after the wedding. Can’t keep calling him the Hunk after that anyway. He’ll be the hubby. Heh.